In the recent May 2013 local elections support for UKIP soared to more than 25%, over taking the Liberal Democrats as the third party of protest as the major parties haemorrhaged voters due to their respective failures to address a crisis that has been fermenting over a near decade that has its roots in Labours open door policy to immigration from all new eastern european accession states, especially as many in Britain now fear another re-run of what followed the likes of Poland joining the EU near a decade ago as Bulgaria and Romania joining will likely see as many as 400,000 migrants over the next 3-4 years which is set against official expectations of just 13,000 new arrivals during 2014 (Communities Department). The current official estimates of immigration are just as bogus as those of the last Labour government's which expected in 2004 that only 50,000 new arrivals would arrive from the then new eastern europe member states, instead Britain witnessed its greatest influx of immigrants in many generations, with eventually more than twenty times the propaganda number arriving in a relatively short space of time, which converts into a number nearer to 200,000 arriving during 2014, and as many as 100,000 migrants per year for several years thereafter, which suggests that rather than official estimates of 25,000 over the next 3-4 years the UK will likely witness mass immigration from Bulgaria and Romanian of well over 15 times that number. Which will be in addition to the mass migrations already underway from the bankrupt euro-zone member such as Ireland, Spain, Portugal and Greece as a consequence of soaring youth unemployment rates (18-25 and under) that stand at between three and five times that of the UK). Whilst many mainstream politicians argue that those who will come to the UK will mostly be along the lines of the last mass migration from the likes of Poland i.e. young hard working individuals, however the problem is that most of the young hard working Bulgarians and Romanians have already migrated (estimated 200,000) to the UK during the past 5 years via a whole host of avenues such as work permits and low skilled quota schemes, all of which will be abandoned as of 1st of January 2014 in favour of a complete open door policy. Instead it is highly probable that many of the future arrivals from Bulgaria and Romania will tend to be poor families who will seek to target Britians welfare system as the level of poverty in the newest members states are at European extremes that only the likes of the Roma communities have experienced in the former Czechoslovakia, in which case the calculations will be pretty easy for most migrants for why would a family subsisting in Romania on less than 1/10th the resources that will be available in the UK not migrate whole families to Britain who will have the same rights as any British citizen for access to the whole hose of services and benefits available from housing, hard cash, schools and the NHS. After all, if Britain's population could similarly attain an income that was near ten times the benefits cap of £26,000 in another european state (£260,000), then the UK would also likely witness a mass exodus of many benefits and low income families out of Britain. The remarkable showing of the UKIP of 25% in the local election is not going to be replicated at the next general election. Instead history suggests in terms of what happens to mid-term protest votes, that it is highly unlikely that UKIP will be even able to attract half the vote that they are able to today, i.e. a more probable outcome is 12% of the vote which at best will only win UKIP a handful of seats, not even enough to make any difference in an hung parliament. Instead where the UKIP vote will influence the election is in the fact that they will take twice as many votes away from the Tories then from Labour and therefore as things stand virtually ensure that the Labour party will win the next general by a sizeable majority. I am sure that the leadership of the UKIP fully understand this and therefore over the next 2 years we will likely see tactical voting agreements emerge between UKIP and the Conservatives in favour of 'promises' of UKIP friendly policies. In the meantime Conservative MP's are falling over one another to become anti-european as they run scared of losing their seats to Labour at the next election by virtue of lost votes to UKIP. The recent events out of Woolwich reinforce my view that multiculturalism is an extremist policy that promotes inter communal conflict rather than integration and is as a consequence of successive government objectives for the fragmenting of society into creating pools of vested interest voters. Whatever the Government of the day, there has always ever only been one solution for EVERY problem that confronts it and that is one of printing money to bribe the recipients so as to create vested interests. With regards to Islamic extremism news topic of the day, it amounts to effectively bribing extremists to not blow themselves up, i.e. for extremists to go onto the Home Office, Communities Department and even the MI5's payroll, the estimated amount that Britain spends per year to bribe extremists to not blow themselves totals approx £700million, which given the ongoing news story out of Woolwich is likely to increase further. The mainstream press in near totality has this past week been focusing on either current or former extremists that rarely represent a fraction of 1% of the population's from within which they emerge (as is nearly always the case). The bribed former extremists have been busy these past weeks earning their bribes on the news channels as they are presented to explain what is happening and why and what needs to be done, whilst conveniently not mentioning that they are on the payroll of government funded agencies. Furthermore the solutions put forward invariably involve more tax payer funding towards anti-extremism projects as the various groups seek to personally capitalise on the Woolwich murder. This tends to send out the message to the wider population that there are generally only two types of muslim, current or former extremists, whereas the truth is that the number of extremists is a fraction of 1%, though both the media AND muslim agencies purporting to represent muslims will tend to exaggerate the number, where the media does it for readership and advertising and the muslim organisations for an increase government funding and other financial support. This further illustrates the government policy of bribing everyone and everything with printed money be it called QE or Government debt that will never be repaid but is rolled over in perpetuity. This is why Scotland is unlikely to go independant because the Government of the day effectively bribes the Scottish electorate to stay in within Union to the tune of an extra £1600 per capita of state spending over England, and the same is true for Northern ireland and Wales. - This IS what drives the Inflation mega-trend and why there will never be Deflation because ALL governments default setting is to PRINT to BUY Votes, be they terrorists, nationalists, socialists, or even capitalists. We are ALL being bribed ALL of the time to become vested interests. So the word has long since gone out amongst deprived communities that there is funding to be claimed and profits to be made as a gullible government seeks to throw hundreds of millions a year in their direction. Thus Islamic radicalism in Britain can be a career choice for many young people because just like their benefits claming for life children producing white brethren, they too can skip the hard work route and land themselves onto the governments money for nothing payroll just as the Government has done in places such as Northern Ireland. The more the observed problem of extremism in any particular community then the more tax payer money will be flooded into such areas to fund anti-extremism projects and related social projects for which many Imam's and bogus scholars will step forward to profit from. If the mainstream press wants to earn any credibility then they need to state that virtually EVERY former radicalised person they have put on the likes of Newsnight this past week is in some manner on the governments payroll. Instead the real solution is to end multiculturalism (all cultures are equal) and instead promote INTEGRATION. So politicians instead of expand the cultural differences between peoples in pursuit of creating and maintaining pools of vested interest voters should reinforce the strengths of British culture. affirmative action for disadvantaged immigrant groups. The following table shows the total score's for each country, and the global trend towards multiculturalism by most western nations. The table shows no change in the policies of Multiculturalism in the United States which as the world's largest immigrant melting pot where the over-riding policy remains firmly grounded in one of Secular Americanism. The mixing of cultural diversity is good for Britain but multiculturalism is bad in that it ultimately sows the seeds for future conflict. UKIP gives Britain an opportunity to correct the path it is on before the multicultural immigration crisis further intensifies. The bottom line is the Council of Muslims, Jews, Hindu's, Sikhs, Poles, Arabs, Afro-Caribbean's, Somalis, Chinese who purport to represent their respective population groups and thus encourage division because it is in their self interest to do so. Instead ALL of the people of Britain already have political representatives in Parliament and local councils and therefore NO state funds should be expended on supporting the whole host of divisive multicultural charities and institutions. The bottom line is that regardless of any war crimes committed by British soldiers abroad, instead it is up to every British citizen regardless of religion / culture or origins to seek out to preserve Britain as an Oasis of law, order, justice and civilisation in a world that will always be wracked by chaos and violence, after all this is the precise reason why most people have migrated to Britain in the first place. Despite the fact that only a person who is clearly insane could do what was done in Woolwich, still in its aftermath the rise of EDL / BNP shows that civilisation is fragile which needs to be actively protected against extremists by the vast majority of citizens, and it should be the role of the state to promote British culture and identity rather than the fostering of a fragmented multi-culture that sows the continuing seeds of resentment and ultimately future inter-communal conflicts. The influx of upto 500,000 migrants over the next 3-4 years will be housed in large part by the state either in private landlords or in social housing. Therefore this will continue to put immense pressure on social housing which will effectively put the final nail in the coffin of council and housing association waiting lists where it will be virtually impossible for those in existing social housing to move to another social housing in major urban areas, the only option available will be to move out of social housing into private rented accommodation as the focus will be further intensified towards only housing homeless British and migrant families. However as I earlier noted in the article (13 Mar 2013 - SMI Labour Benefit's Culture Catastrophe - Come to Britain and We Will Pay Your Mortgage!) that the benefits system does allow claimants to engineer the purchase if properties where the interest on upto £200,000 of a mortgage is paid for by the tax payers in perpetuity. This currently results in the state paying for over 250,000 mortgages, where approx 50% of claimants are pensioners, despite the fact it was meant to be a temporary support for workers losing their jobs. The impact on the housing market will be two fold, firstly it will encourage the indigenous population on Benefits into temporary employment as that will be the only route for many to move to a better located property and it will lead to further demand for private rented properties, both of these will have the effect of creating demand at the bottom end of the housing market that will ripple out across the housing market due to increase in housing market transactions which is the real life-blood of the housing market. This article illustrates just one aspect of the many factors that are exerting upward pressures on UK house prices that I have been flagging since the start of the 2012, as the embryonic bull market of 2012 increasingly morphs into a full fledged bull market of 2013 and beyond, which off course is already well underway in London courtesy of the top down ripple effect of the annual influx of billions of dodgy funds not just from Russia but from across the whole globe which sees London's properties as one of the ultimate safe havens that has already had the effect of wiping out the preceding 25% London house price crash and which I expect to be replicated near nationwide over coming years. Whilst the immediate reaction to an new influx of migrants into existing indigenous area's will be to push down house prices, as the existing population tends sell up and move out. However over time as the Ghettos become more established then there will be a tendency for the epicentres of most Ghettos to see an above average increase in house prices as the 150,000+ annual net immigration results in a continuing extra demand for housing in these areas whilst at the same time there will be a tendency for the outskirts of the ghetto's to lose house price value in a ripple out effect as the indigenous population seeks to relocate and move out of the changing ethnic environment and thus increasing supply of properties on the outskirts of ghettos. As is always the case many additional factors need to be taken into account such as the the unemployment rate, crime rate, risk of flooding, quality of schools etc, especially as migrants will tend to push down school performance tables due to the extra demands such as poor language skills and cultural differences. The investment opportunity here would be to accumulate properties on the periphery of ghettos with a view to rental income as it is expected an expanding Ghetto will push up house prices in the future. Apart from traditional buy to lets in expanding Ghettos, there is also an ongoing opportunity to literally pick up mansion size properties right smack in the middle of many urban areas of most of Britain's major cities. Without knowing it you will likely pass by many of these boarded up large properties on a daily basis without ever giving them a second thought as to the opportunities they represent. Furthermore the supply is not diminishing instead another 20 such large properties join their ranks every week! What can I be referring to ? Literally thousands of pubs have closed over the past 10 years as a consequence of the super markets taking much of their traditional business away whilst local demographic changes courtesy of the immigration crisis virtually wiping out most of their remaining customer base as traditional British pubs do not tend to be frequented by immigrant populations, this has resulted in a huge opportunity for property developers that I have personally witnessed, where those with time on their hands can make as much as X4 the cost of purchase and development by turning boarded up pubs bought at auction into flats and commercial premises or if they so desire a large residency for their own use. 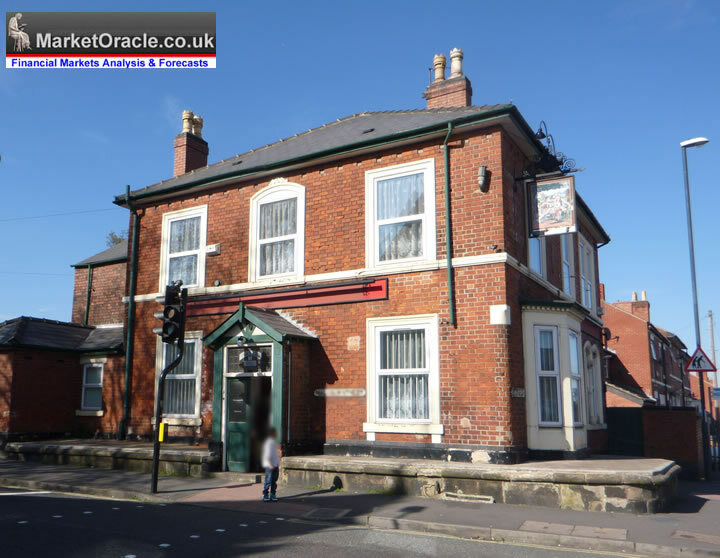 In the local auctions that I track at least 2 or 3 pubs crop up each time, many require much work in terms of planning and building works and thus can be picked up for far less than much smaller residential properties within the same area, and thus huge rewards are possible for those with the ability to capitalise upon them. Whilst thousands of shops are closing down across Britains high streets each year due to competition from the internet, shopping malls and ridiculous local council policies in terms of high parking charges. However this presents an ongoing opportunity to pick up retail properties in a similar manner to pubs on the cheap on the outskirts of the expanding Ghettos as immigrant populations will tend to seek out stocks of goods and services that are not provided for by the super markets or chain shops but rather available from local community shops. Looking wider a field there is another UK housing market opportunity trend in progress courtesy of the financial crisis and that is in buying closed down bank branches. Whilst disappearing bank branches is a near decade old trend, however once upon a time the tendency was for bank branches to be converted into pubs or wine bars that happens far less frewuqnrly today then several years ago, therefore increased supply of bank branches coupled with decreasing demand from competing sectors such as the pubs, gives prospective buyers another opportunity to pick up large properties in prime locations at deep discounts for development. The ongoing recession continues to push many businesses to the brink that is resulting in a steady supply of freehold light industrial units comprising of offices and workshop areas becoming on the market and usuaully again at auction. Competitively priced greenbelt land that is adjacent to existing housing developments, where should planning permission be granted at a future date the value of the land could literally increase 100fold. However it may take a decade or more, and one needs to pay special attention to any clauses such as that if any profit is made on the land as a consequence of the granting of planning permission then that would need to be shared with the previous land owner, in my experience a 50/50 split tends to be the norm that diminishes over time, i.e. after 20 years any planning permission development profit would no longer need to be shared with the previous land owner. This article is part of an ongoing series mapping out key drivers for the UK housing bull market now underway. My approximate expectations are for the UK to follow a similar trend to that of the US Housing market which I forecast to rise by 30% by early 2016 (15 Jan 2013 - US Housing Bear Market Over? House Prices Forecast 2013-2016 ). The following graph illustrates the current state of the new UK housing bull market of 2013 following the embryonic bull market of 2012. The bottom line is that the UK housing bull market is now well underway for which readers of my articles have had well over a years head start! This is a new bull that has many years to run the trend for which I will seek to map out over the coming months. The following represents my asset allocations and targets by end of 2013. UK housing market analysis continues in my next article on population growth and earnings as academic economists repeatedly mistakenly state that UK house prices cannot rise whilst average earnings are falling, so ensure you remain subscribed to my always free newsletter to get this in your email in box. The real point about the UK leaving the EU is that it will only do any good if it is done as a first step to building a viable free market economy. By all means cut ourselves loose of the burning platform of the EU, but if we carry on attached to the other one of socialism then it will all come to nought. Re housing, the mistake I see people making is the same one they made in the late 80s when they took on too much debt to buy. When interest rates turned against them they got reposessed. It is cold comfort to these people that those houses are now 4 times value, because they could not ride the storm. I think buy to rent has got to be a winner over the next ten years though. An anti-migration war is the last thing Europe needs at present. But I think your fear of a new influx of Romanians and Bulgarians is wide of the mark. Conversely, employers in the vegetable picking and packing business expect a mass exodus of these workers to result from the imminent opening of the labour market in Germany and elsewhere. Fearful that vegetables will soon be rotting in the fields, they are begging the government to allow them to recruit in Ukraine and elsewhere. 1,800,000 UK citizens are presently living elsewhere in the EU. If we close our borders to EU nationals we can expect all those to be sent "home". The EU has many faults, but without free movement of goods, capital and people we would all be poorer. I agree that public grants to help immigrants to maintain separate communities are barmy. But in my experience the only foreigners who generally wish to remain apart are Muslims. Others are happy to integrate, and it is towards that end that any public money should be directed, especially to improve their English and their knowledge of our way of life. The table showing "the global trend towards multiculturalism by most western nations" is strange. For starters, it includes Japan and New Zealand, which by no stretch of the imagination are "western nations". So why does Singapore not qualify for inclusion? Singapore positively revels in multiculturalism. Inter-racial marriage is on the increase, and only the 14% who are Muslim Malays are determined to stand apart. Singapore has a national population of some 4 million on an island the size of the Isle of Wight, and still employs another 1 million "guest workers". And by most measures Singapore has the highest standard of living in the world. Net migration of over 150k per year is an important driver for the NEW housing bull market - currently underway. The reason why singapore is successful because it has a strong singaporian identity amoungst its many people, i.e. they put citizenship AHEAD of their religion, that is NOT the case amongst most UK immigrant communities who put RELIGION ahead of citizenship because the UK political system is motivated to create vested interest voting blocks. Britian could learn a lot from Singapore in fostering of a British identity and secular elements such as banning of religous symbols such as headscarves in schools which is how it is in Singapore. The facts are that immigrant communities in the UK do not integrate as a consquence of multiculturalism you see this in virtually EVERY immigrant community, name any community arriving during the past 50 years and I will list their isolationist ghetto's, Muslim, sikh, hindu, even east european christians,becasue the system does not foster integration but supports seperation. This will be the experience of most people that reading this. Original analysis, as always. Like the concept of pubs being mansions haha. 1) Interest rates. over the term for which your housing forecast mentions, it is likely that rates will rise? By 2015 (if we take your previous 2009 rate forecasts as example) we could see the 10yr around 3.5% at least. Mortgage rates around 5-6%. This will put significant downward pressure on your forecast. 2)I recall you writing previously, London would see the largest gains in house price potentially. Foriegn buyers are a very large percentage of buyers of anything over 500k, which is largely what has kept London prices sustained. 3)Capital flows. US is likely to have to raise rates soon. How will global capital move? Will EU buyers trying to escape bank deposit taxes flee to US property instead? Net I'm looking for prices to stay flat in real terms (which is good enough). 05 Jun 13, 00:51 UK Housing Bull Highly Probable. One only needs to look at the bearish mantra in the face of a 5 year bull market in stocks to see how easy it is to paint a contrary picture, which as you suggest can also be easily done for UK housing as well. My primary objective is to identify high probability trends and then put my OWN money on the line. This is what drives my analysis. So I am not going to put 60% of my wealth into UK housing on a whim, rather I am very confident that there is a high probability for success, just as I avoided UK property from 2007 to early 2012 due to my expectations for first a crash and then depression in house prices. So yes, it is very easy to paint a bearish picture for UK house prices, I can do it very easily, i.e. 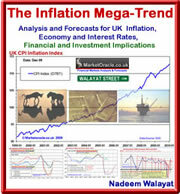 falling real terms wages, future interest rate hikes, end of QE etc... it is very easy to do, BUT, it is NOT PROBABLE! i.e. the drivers you think will drive prices - WON'T! We have seen this with the stock market with the debt deflation mantra and it is only with hindsight that the FOOLS that populate the financial press / sales men refer to what actually has driven the stock market i.e. rampant money printing as I stated right at the start in March 2009. The UK housing market is now in a bull market, this is not based on hope but what I see as the most probable outcome and as the trend manifests itself then so will the outcome become more probable, all the way to the next bubble peak. I was about to raise the question of interest raises 4/5 year out putting strong downward pressure on any housing boom that looks set to occur in the meantime due to the combination of cheap money, the government now encouraging banks to actually lend that cheap money more widely and the supply and demand arguments raised above concerning increased immigration and limited housing stock. But Zahlen beat me to it. "1) Interest rates. over the term for which your housing forecast mentions, it is likely that rates will rise? By 2015 (if we take your previous 2009 rate forecasts as example) we could see the 10yr around 3.5% at least. Mortgage rates around 5-6%. This will put significant downward pressure on your forecast." I can see opportunity therefore on a 4/5 year basis but worry that it will end in tears slightly longer term when interest rates rise significantly. Of course property is an illiquid asset and costly and time consuming to get in and out of and so would worry that over this time frame it maybe high risk. And over the longer term which is the time frame you'd typically invest in property, I'm not sure how prices will fare in a higher interest rate environment when prices will have risen from today's already high prices. After all houses aren't cheap are they ? They are affordable (temporarily) due to artificially low interest rates ? Just my rambling thoughts. Thanks for your writings and thoughts on this. It is just too early in the trend to think about when it will end, i.e. I would not be surprised if the new bull market runs for the next 10 years. thanks for your reply Nadeem. Yh, got to admit, your property calls have been impressive (and the Dow also). the call on property rallying into June 2010 election was very slick. I agree with Pablo on the duration of the property market sustainability. Also, as I've previously read, you are against debt (well dont favour it when buying properties). Although, I dont think many people reading this will be able to buy in cash in London! Great analysis as always. Always great to read it. Although I do not agree with your immigrant multi culturalism comments. People complaining about economic migrants, not wanting to totally immerse themselves in British culture, do Brits in Spain start speaking Spanish? My 2 cents. Now I read back my comment I realise it is more that we are not starting from a low base in prices that is my main issue. At the end of the 80s prices that were affordable at 12% mortgage rates became unaffordable when rates rose to 15 or even 17%. This really crushed the housing market (far more deeply than in recent years) to the point where sentiment and prices took a real beating over a number of years. In parallel we were moving from a double digit interest rate environment to a much lower interest rate environment and by the time sentiment turned back prices were dirt cheap on affordability basis because of the beaten down prices and low interest rates. And interest rates kept going down fuelling the boom! Until you had a period like 2003 where mortgage rates were a fraction of what they were in the 80s and average incomes were on the their way to doubling - is it any wonder we had a massive boom ? Easy to see in hindsight. Interest rates can't go any lower and the best hope is that there are no significant rises for a few years yet ? Surely any boom will be a much more short-lived one ? But I do think the housing bull market, like the stock market, has more to come, I just think best gains are behind us for both ? There are so many drivers for UK house prices that its going to take a dozen more articles to get through the main points. Other important factors I have covered at length during the past year illustrate why its always different this time, cannot say because last time it was x,y,z so it will be the same this time. Thats NOT how it works, not for stocks, not for housing. For instance, when the banks start to go bust, and they WILL! Then what is the risk of holding cash or property? The smart money knows this and has been vacating cash for hard assets such as property. So my focus on property has been for protection from my wealth being stolen, which if it were left in the banks it WILL be! The money you think you have in the bank is NOT YOUR MONEY, It can be stolen at ANY time Cyprus style, think about that and then look at the drivers for house prices going forward, NO Rear view mirror here, it's a case of anticipating the FUTURE. i.e. What for house prices when inflation is running at 20% per annum? Some times people need to be jolted into facing reality, in that the government WILL steal your wealth!